This is outsourced almost entirely to Wallace Shawn, who is one of those exceptionally intimidating talents who seem capable of making art and engaging ideas in almost any way he chooses. It’s a genuinely wonderful example of essay-form, a direct descendent from the ur-specimen we credit to Montaigne. Shawn puts on a masterly display, demonstrating just how much power derives from the concentration of a sharply individual point of view on experience and ideas — which is the essence of the personal essay. In this case, it’s the gaze of a man of the theater that leads us into a sequence of images and thoughts that land at a devastating moment of moral vision.Beyond the story it tells in it’s own frame, the piece captures for me some large part of why our current politics leaves me so full of dread and sorrow. As for all the other babies, the market sorts them and stamps labels onto them and hurls them violently into various pits, where an appropriate upbringing and preparation are waiting for them. If the market thinks that workers will be needed in electronics factories, a hundred thousand babies will be stamped with the label “factory worker” and thrown down into a certain particular pit. And when the moment comes when one of the babies is fully prepared and old enough to work, she’ll crawl out of the pit, and she’ll find herself standing at the gate of a factory in India or in China or in Mexico, and she’ll stand at her workstation for 16 hours a day, she’ll sleep in the factory’s dormitory, she won’t be allowed to speak to her fellow workers, she’ll have to ask for permission to go the bathroom, she’ll be subjected to the sexual whims of her boss, and she’ll be breathing fumes day and night that will make her ill and lead to her death at an early age. And when she has died, one will be able to say about her that she worked, like a nurse, not to benefit herself, but to benefit others. Except that a nurse works to benefit the sick, while the factory worker will have worked to benefit the owners of her factory…. As I said, there’s more, presented as Shawn intended. Go read the whole thing. 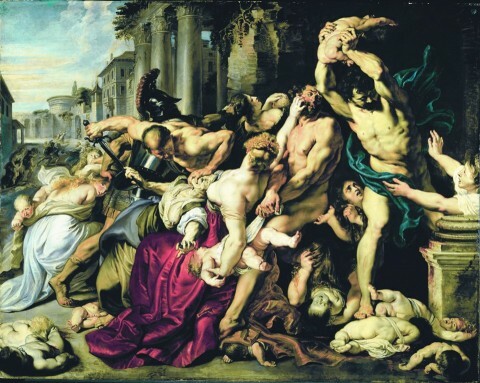 Image: Pieter Paul Rubens, The Massacre of the Innocents, 1611 or 1612.